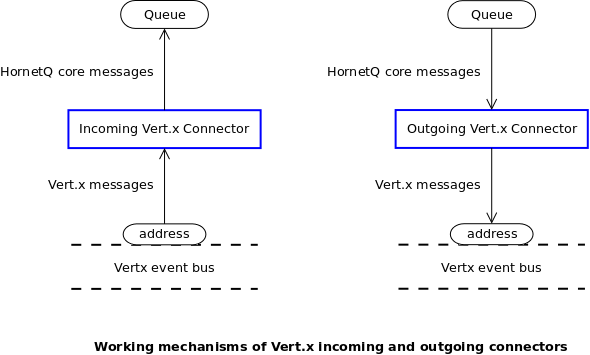 HornetQ now provides Vert.x connector services that can redirect and persist vert.x messages to HornetQ queues and route those messages to a specified vertx address. applications. Vert.x provides a distributed event bus that allows messages to be sent across vert.x instances and clients. There are two kinds of Vert.x connector services, an incoming connector service and an outgoing connector service. service consumes from a configured HornetQ queue and sends/publishes them to Vert.x event bus on a configured address. queue back to Vert.x event bus through an outgoing connector. • queue. The name of the HornetQ queue to send message to. • host. The host name on which the vertx target container is running. Default is localhost. • port. The port number to which the target vertx listens. Default is zero. • quorum-size. The quorum size of the target vertx instance. • ha-group. The name of the ha-group of target vertx instance. Default is hornetq. • vertx-address. The vertx address to listen to. default is org.hornetq. • queue. The name of the HornetQ queue to fetch message from. • vertx-address. The vertx address to put messages to. default is org.hornetq. • publish. How messages is sent to vertx event bus. "true" means using publish style. "false"
means using send style. Default is false.